(a) It designates an old man or old woman in general, as in the saying "an old man ["saba"] in the house means ruin, but an old woman ["sabeta"] is a treasure; since the former is unfit for work, while the latter helps in the house" ('Ar. 19a). 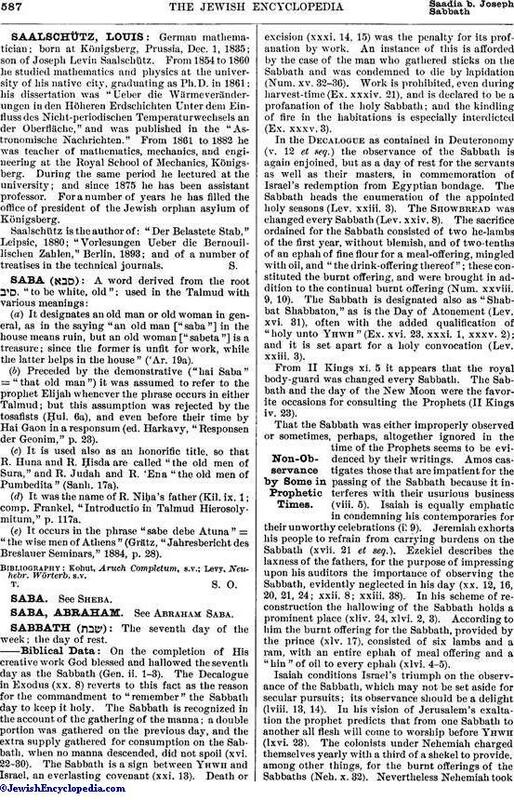 (b) Preceded by the demonstrative ("hai Saba" = "that old man") it was assumed to refer to the prophet Elijah whenever the phrase occurs in either Talmud; but this assumption was rejected by the tosafists (Ḥul. 6a), and even before their time by Hai Gaon in a responsum (ed. Harkavy, "Responsen der Geonim," p. 23). (c) It is used also as an honorific title, so that R. Huna and R. Ḥisda are called "the old men of Sura," and R. Judah and R. 'Ena "the old men of Pumbedita" (Sanh. 17a). (d) It was the name of R. Niḥa's father (Kil. ix. 1; comp. Frankel, "Introductio in Talmud Hierosolymitum," p. 117a. (e) It occurs in the phrase "sabe debe Atuna" = "the wise men of Athens" (Grätz, "Jahresbericht des Breslauer Seminars," 1884, p. 28).